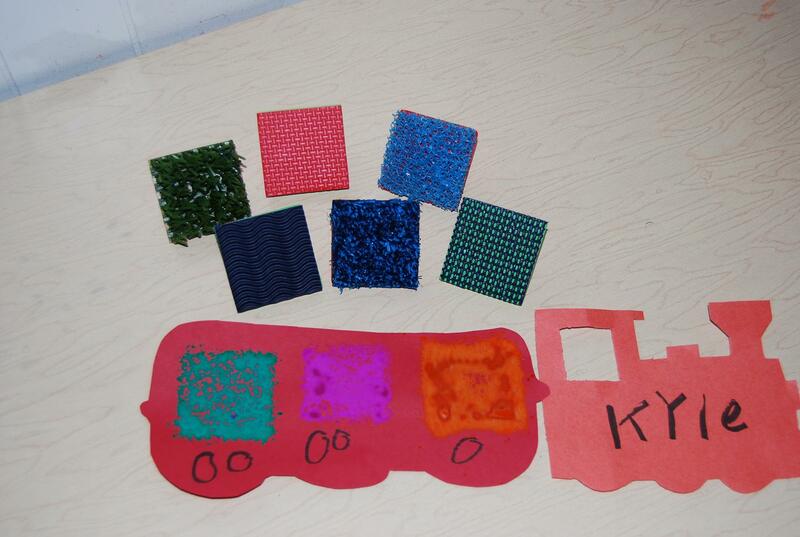 We used texture stampers (square) and tempera to paint the train cars. If you do not have textured stampers, the children can paint with various materials. Suggestions might include: cotton balls, cardboard, leaves, other nature items, Q-tips, or bubble wrap. The engine template is from the is available in the Transportation Theme available here on the blog! one at a time and discuss if that is a useful/necessary item. When finished, give each child an index card for their train ticket. Their “ticket” should have their seat letter or number on it. The child takes their ticket and finds their seat on the train. After all of the children have found their seats, the conductor comes around and makes sure they are sitting in the correct seat. If so, the “conductor” uses the hole punch to punch their ticket. Finally, have fun on your train trip! Let the children explore and use various maps. AAA is a great resource for obtaining maps if you are a AAA member! Ramps Materials needed: Miscellaneous objects to use as ramps for their toy cars to drive down. Objects can include: empty food boxes, large pieces of cardboard, blocks, wooden boards, etc. Extensions: Race cars down different ramps; How far does a car go on a ramp? ; Can you make the car go farther/faster/slower depending on how you change the ramp? ; Etc. Paint small food boxes and turn into buildings. Use along with your block center for the kids to make “towns” and kids can drive around. Have the kids take out instruments and decide what instruments would make a small sound like a car horn, or a big sound like a jet engine. Continue thinking of examples for big/small vehicles and/or the sounds they make. For MORE playful learning suggestions, see the entire Transportation Theme! The theme includes: literacy, math, science, gross motor, dramatic play, arts and crafts, and an extensive book list. All pdf files and PowerPoints are included in the download.